Our mission is to create happy, capable, confident, life-long learners and the school selection process is where this journey truly begins. For students with learning differences, it is crucial that they be in an environment where they will receive the right kind of instruction and strategies to meet their unique needs. 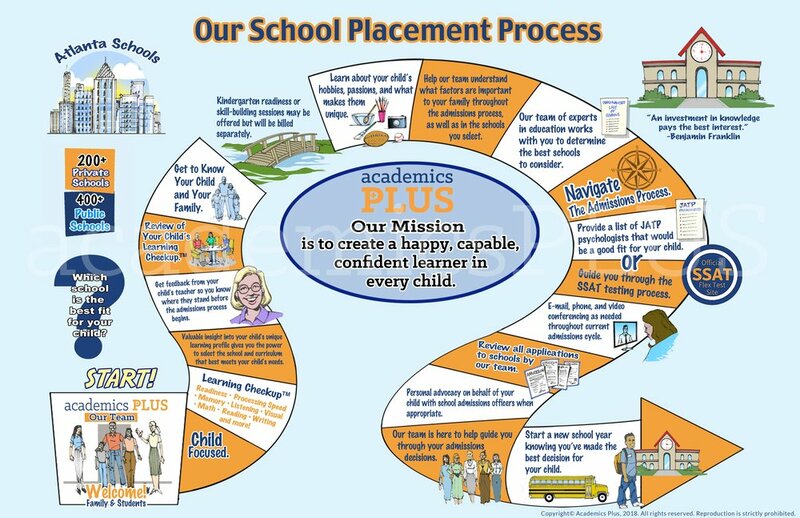 Our school placement team’s vast understanding of how children learn ensures that you are equipped with the necessary knowledge to make the best educational decision for your child, so that they may thrive in their school setting and beyond. With seemingly endless school options, a major financial investment, and your child’s educational career on the line, it is essential that our team of educational experts help you make the best school choice for your child and your family. Our knowledge and training goes far beyond that of a traditional school placement consultant; our team has years experience in the classroom, working with educational psychologists, administering Learning Checkups™, and teaming up with learning specialists and admissions officers to ensure that each individual learner’s needs are met. On top of this, our team operates a learning center that serves students from all over the Atlanta area on a daily basis. We have witnessed heartbreaking stories over the years of students who are struggling in their current environment due to learning challenges. Our experience with these students has equipped us to help guide families in any situation, even ones that may require an “out-of-the-box” solution. Our in-depth experience in education, coupled with our unique understanding of school placement empowers you, as parents, to make the right educational decision for your child from the start. 2) To gain knowledge from all perspectives, including you, as parents, current teachers, and any others that you believe could help to paint a picture of your child’s needs and your family’s core values. 4) To help you navigate the admissions process, from school selections and visits to submitting applications and reviewing decisions. If you already know that you will be applying to private schools, we highly recommend that you contact our team in May of the year you would begin applications later that Fall/Winter. This allows us ample time to fully understand your child’s needs, address any areas of weakness, and ensure we are guiding you down the best path for your child. We recognize the enormity of the responsibility you grant us as educational consultants for your child and appreciate the opportunity to serve your family. In order to best serve our families, we will offer a limited number of Priority Client packages. These packages will be filled on first come, first serve basis and will be valid for one admissions cycle. If you are interested in reserving a consulting package, please fill out the form below. Our team strives to support our families in the best way possible and sometimes that may mean beyond the school transition. Clients can retain our services throughout their child’s school year in order for us to stay in the loop, communicate with teachers and parents, and advise when necessary for a fee of $175 per month. Our goal is not only to help our students find the best school fit, but also to help them transition well and become happy, confident, life-long learners!